What Should I Bring to the Best Beaches on Oahu? – A Beach Towel. Most tourists forget a simple beach towel and are forced to buy one that is overpriced at one of the many souvenir shops. Instead bring one from home! Or buy one online before you leave for your trip, like this one, or one of my personal favorites, this one made by local artist, Nick Kuchar. – A Beach Bag is another commonly forgotten item on the Hawaii packing list. Usually tourists end up carrying all of their beach gear in a Walmart bag that has already started to tear. Instead of praying that your plastic bag won’t break as you’re crossing the street, you can use this nice little beach tote or even a simple canvas bag, like I do. – Water Shoes. If you’re planning on heading to some of the less explored beaches with sharp coral or rocks, water shoes are a good idea. They’re especially helpful for children whose legs are not quite long enough to navigate their way over or around some of the sharper objects. – Goggles. To keep the extra salty Pacific Ocean water out of your eyes, so you can keep exploring! – Snorkeling Gear. While you can rent snorkel gear during your trip, if that grosses you out, perhaps pack your own set! This can include a pair of googles, a mouthpiece, and some flippers, if you’re really committed. – Sunglasses. This little item is something that I always forget to bring with me. This is just a reminder to bring a pair! 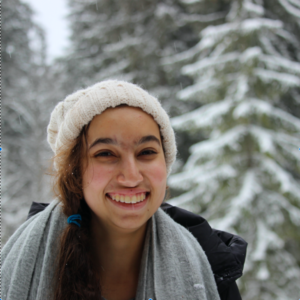 – Water, of course! Maybe in a nice reusable bottle to help the environment out just a tad. – A Snack. Perhaps something from either Part 1 or Part 2 of the Hawaii food bucket list. It’ll be nice to have a snack when you reach the top and are waiting for the sun to rise. – A Waterproof Camera to document your adventures. The GoPro HERO5 is a great option! However, if that’s a little too much money, the AKASO EK7000 is a pretty good alternative. While beaches are places of relaxation and adventure, it is important to be informed about the potential dangers of the ocean as well. There are many, many creatures in the ocean. In Hawaii, you’re most likely to come across some fish, turtles, and maybe even some dolphins! If that is the case, please keep your distance from them! Give them space to move around. Also, if you think about it, the current could push you or the sea creature into each other if you are too close. And I don’t think the animals will be too happy that you invaded their personal space bubbles. As expected, certain beaches around Oahu have quite a bit of sharp coral and rocks. Usually, an easy way to avoid this is by swimming instead of walking. However, if you’re not quite comfortable doing that, water shoes can be a good move. That said, try not to step on the coral as much. Coral is actually home to a large portion of the food of ocean-living fish and other sea creatures. When people step on coral, it actually kills this food supply. Please keep the health of the ocean and its wonderful creatures in mind! The tide is probably the safety concern that people tend to forget about. When the tide rises, it can make it much harder to get to shore in some places. When the tide lowers, there will be much less water between the surface and the top of the sharp rocks and coral laying on the sandy floor. This is much more applicable when you are at beaches that have no barrier between you and the open ocean. So with lagoons and bays, this is slightly less applicable, but still applicable nonetheless. Ok, I’m Ready! 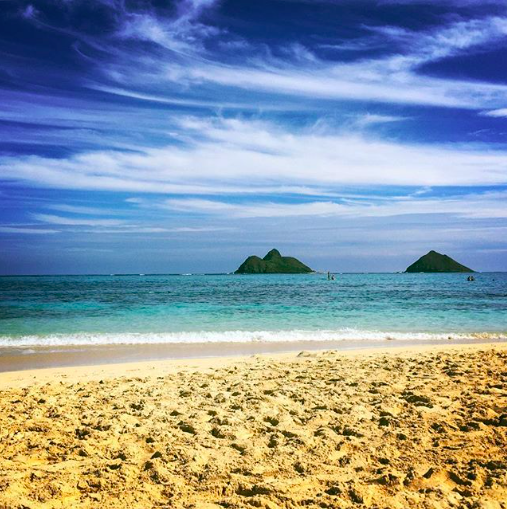 Tell Me About the Best Beaches on Oahu! Are you a surfer? This is the place to go. You can surf huge waves or watch pro surfing competitions at Banzai Pipeline. Take note though, the waves are HUGE and dangerous here. If you are not a confident surfer, Pipeline is definitely not the place to test your skills. There is a parking lot right across the street from Banzai Pipeline. Usually, it is pretty empty, except, of course, if there is a surf competition taking place. Looking for other North Shore beaches that are worth your time? 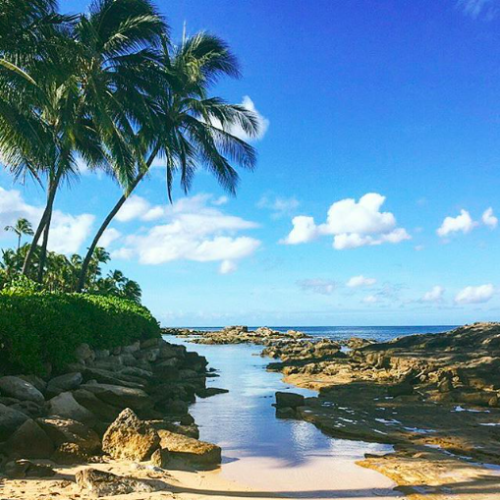 Check out The Ultimate Guide to the North Shore, Oahu. Looking for the best snorkeling beach on the North Shore? Three Tables is where it’s at. Most people will say it’s Shark’s Cove, but that’s pretty shallow. And if you choose to venture out into the deeper waters, well, you’re basically at Three Tables anyways! At three tables you can come across schools of colorful fish and sometimes Hawaii’s signature turtles. Just be sure not to go further out than the three “tables” (the three round flat pieces of reef that just breach the surface of the water). Past there, the current gets significantly stronger, and you might not realize how far and fast you are moving. There is a small parking lot for Three Tables, but it can get filled up quite quickly. If that is full, head to the nearby Foodland, pick up some local snacks, and leave your car there. Waimea Bay is home to Oahu’s iconic cliff jumping rock. Not only that, but it’s the only beach on the North Shore with a lot of space to swim without huge waves that make it a bit more difficult. While Waimea Bay does have a parking lot, it gets full very fast. In other words, if you are committed to going to Waimea Bay, get there early. Kualoa Regional Park in Kaneohe is another unique Hawaii beach. From this beach, you have a stunning view of an island called Chinaman’s Hat. While the beach here is quite rocky, if you can make it out closer to Chinaman’s Hat (which is doable, but dangerous at times. Check out the tips in the previous link. ), the rocks disappear just enough to have a nice little swimming area. And because very few people head to this beach and make an effort to swim out, odds are you’ll have the space all to yourself! There is a large designated parking area for Kualoa Regional Park. This beach is easily the best snorkeling beach on Oahu – at least in my opinion. While Makaha Beach is rather hidden and unknown to tourists, this is the beach at which I’ve seen the most turtles in one visit (I want to say it was around six turtles). It’s also a spot known to have dolphins pop up in the early morning. Make sure you have some goggles and flippers before you head out to spot dolphins! And definitely know your limits. Parking for Makaha Beach is basically just off the road on the start of the sandy area of the beach. *Warning: Makaha Beach is far into an area of Oahu called Waianae. They are not very fond of tourists in this area, so please keep that in mind. Petty theft is also quite common, so if you leave anything in your car that looks valuable (or could contain something valuable, like a bag) try to hide them either in the glove compartment or under the backseat (think like airplane-style). Overall though, it is safe to go to Makaha Beach. A long, long time ago, Lanikai Beach was one of the hidden beaches on Oahu. Then it became the token “hidden beach on Oahu,” so it ended up getting to the point that it was no longer hidden. However, that’s not to say it’s not stunning anymore, because it is. The large leafy bushes and a row of houses block any view of the beach from the road, creating a real illusion of seclusion. The turquoise waters and bright white sand are still there, and the sun shines just as brightly. One of the only downsides of Lanikai Beach is the parking. Only street parking is available, so make sure you don’t block any residential driveways! Does this sound like a beach on Oahu that you would want to visit? Think about pairing it with the Lanikai Pillbox hike! Just like Lanikai Beach, Kailua Beach is another shoreline with stunning white sand and turquoise water. 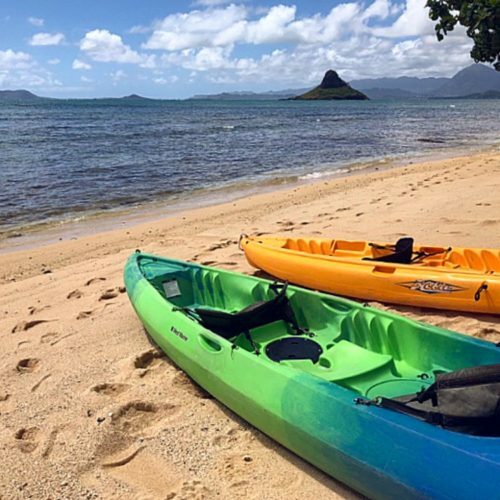 However, one difference between the two is the fact that you can kayak to the two little islands in the distance (called the “mokes” or Mokulua Islands) more easily from Kailua Beach than Lanikai Beach. The second major difference between the two beach is that Kailua Beach has loads of parking, so no street parking necessary! 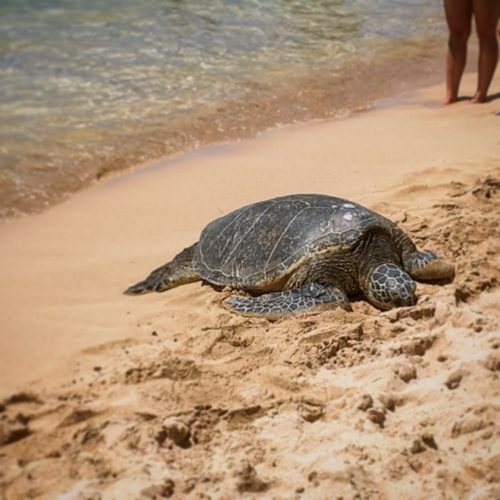 Laniakea Beach has made it onto this list of the best beaches on Oahu for a special reason: turtles. (Or, to locals, honu – check out this post on local vocab. )This North Shore beach consistently has turtles chilling on the shoreline. As a matter of fact, this little beach is probably your best bet to see a turtle on Oahu, although there are quite a few other options as well (including if you want to swim with them). Parking for this beach is directly across the street. While the parking is not official, everyone parks there anyways. 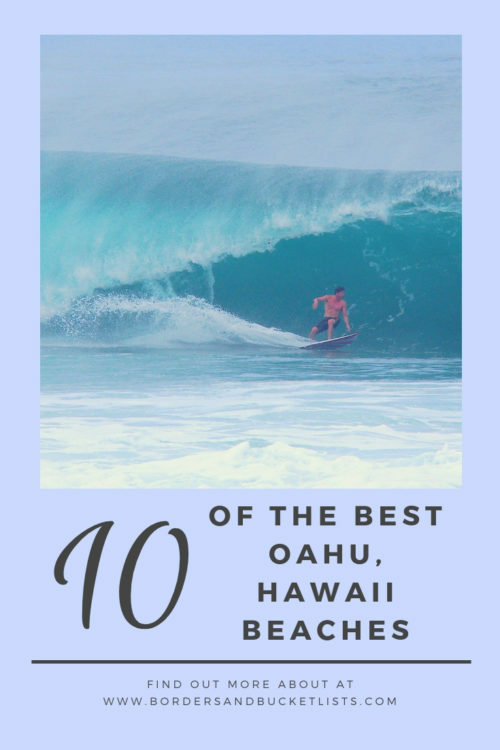 While many people would get upset with me putting the Ko Olina Lagoons on this list of the best beaches on Oahu, it’s made it anyways. Why? Because Ko Olina is another one of those unique beaches in Hawaii. This set of four lagoons is fantastic for sunset views and beginner snorkeling. There are one or two parking sections for each of the lagoons. Lagoon 4 has the largest number of parking spaces by far, so when it doubt, drive to the end. 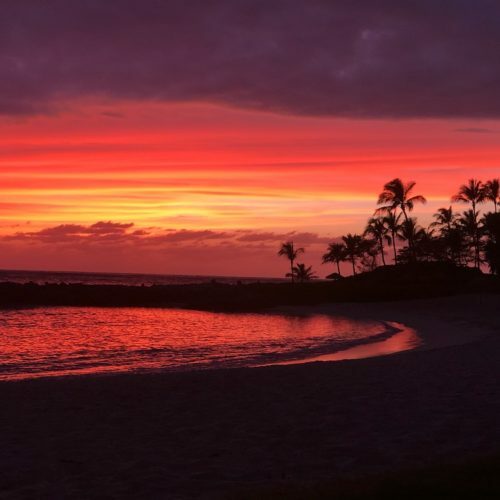 Want some more information on the Ko Olina Lagoons? I have entire guide on the area. Probably the farthest beach from Waikiki, Yokohama Bay is a local hotspot for awesome waves and warm sunshine. It’s the perfect beach to lay out a towel and read a good book next to the deep blue ocean. Parking for Yokohama Bay is just along the side of the small road. 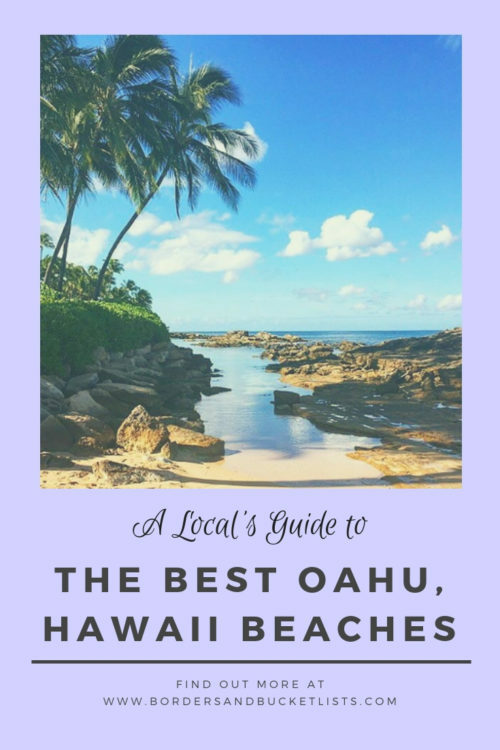 While this list of the best beaches on Oahu is already rather long, I will be sure to update it when I find another beach worthy of this list! Even though I’ve lived on this island my entire life, I still have a list of beaches that I want to visit! If I find them unique or as fantastic as the other beaches listed above, then I will be sure to add them! Planning a Hawaii trip? Is Hawaii on your bucket list? Do you just love the beach? Pin this post for later! Lanikai Beach is my favorite! I used to live on Oahu too! Instead of bringing towels I always go to the ABC Stores and pickup a $3 mat! Super easy and I just toss it at the end of my trip. Ooh that’s such a good idea for a quick vacation! Another excuse to return to Hawaii soon. Yay! I traveled there with my family last year but we explored so much on Maui and Big Island that, by the time we reached Oahu, we didn’t get much further than Honolulu. I had hoped to see Lanikai and Kailua beach we didn’t make it there. Can’t wait to go back! Oahu is definitely worth a bit of exploring, so there’s a lot that you’ll be able to see on your next trip over! I’m off to Hawaii in just over 2 weeks so this will be really helpful! That’s so exciting! Feel free to explore the rest of Borders & Bucket Lists for more local tips!